Getting paving or sealcoating driveway work is tricky because unscrupulous scam artists have muddied the waters by making residents wary of being approached for this type of work. The odds that you can get driveway work by knocking on doors are slim and grow slimmer every day. A popular technique that does work is to distribute flyers. Here are some good flyer tips. 1. The more flyers you buy, the cheaper the price of each individual flyer. Thatâ€™s because most of the printerâ€™s cost is in the setup, and the setup cost is generally the same whether you print 100 or 10,000 copies. So, the first 100 could cost you a dollar each, but if you just let the presses run a few minutes longer, the cost per 100 drops like a rock, and you could wind up paying $150 for 500! Youâ€™re really only paying for additional paper. 2. Considering setup costs, there is almost no sense in buying fewer than 500 flyers as a minimum. In fact, many places wonâ€™t even accept a job for a smaller number. But then, the difference in price between 500 and 1,000 is usually just a few dollars! And, your unit cost continues to fall drastically with each additional thousand you order. So if possible, think in terms of thousands, not hundreds. 3. To be able to leverage print pricing, plan your flyer to have a long shelf life. Do not print any dates, or â€œoffer expires on this dateâ€ kind of language in the flyer. Avoid using photos of people who might not be working for you long term. Donâ€™t reference current events, or other information that could cause your flyer to go out of date. This way, you could safely order 5,000, for example, and be assured that youâ€™ll use them all. 4. The look of your flyer should be an accurate reflection of your company. All flyers have a â€œfeel.â€ Thick, shiny paper with full color and lots of pages convey, â€œWe are big and rich.â€ Be very careful with the feel. Many people who see a rich, luxurious flyer immediately think, â€œWow. Thereâ€™s no way I could ever afford this company. They must charge really high prices to be able to afford this fancy flyer.â€ At the same time, black print on a single sheet of white paper can feel too wobbly â€“ even â€œfly-by-night.â€ So strike the appropriate feel for you and your company. 5. Of all the ways to convey quality in a flyer, the most effective are clean design and excellent writing. It is possible to do a one-color flyer, on a single sheet of colored paper that looks smart and classy. Many contractors believe that their customers will forgive an ugly flyer with bad grammar or spelling errors because, â€œtheyâ€™re not buying fancy words from us, theyâ€™re buying driveways. They donâ€™t care what my flyer looks like.â€ Tsk. 6. More potential customers than youâ€™d care to believe judge your driveway work by the look of your flyer! If you have poor wording, they fear you might also provide a poor driveway. If you have misspelled words, they might believe you just donâ€™t care about errors, and will make mistakes in your driveway work. While professional design and writing can be costly, good design and writing need not cost an arm and a leg. You might find all the talent you need from students, friends or family members â€“ in exchange for a steak dinner or even less. 7. Now, choose the quality of paper and number of colors you can afford that best convey your image. Shiny paper is more expensive than plain, but not that much. Paper thickness is important too, with thicker stock being more costly. However, there are dozens of in-between choices to fit any budget. Additional colors do cost extra, but can be affordable. An excellent starter flyer could easily consist of one color ink, say dark blue, on a single 8.5â€ by 11â€ piece of light blue plain paperâ€¦. or dark brown or red ink on yellow paper â€“ you get the idea. This is a great way to project color at a low price. An excellent way to make your business more profitable is to try to get driveway jobs that are close together â€“ even on the same block. Imagine the efficiencies of landing a deal with four neighbors in adjacent homes, for example. Instead of papering full neighborhoods, house by house, try this experiment. Locate a neighborhood street with several aging driveways on it. Since neighborhoods are often built at the same time, obviously, they tend to age together, and the driveways will wear out at roughly the same pace. Collect about 20 addresses. Use an inexpensive Internet search service to get the names and phone numbers that match each address. You should be able to find a service that costs about $20 per year. their look and extend their life. would only pay $X minus this or that attractive percentage. and let you know if a group is forming. Be sure to include your company name, address, logo and all contact information. And remember, this is just a sample. You must make the changes â€“ indicated in italics â€“ that fit with your particular business and neighborhood situation. Make sure of all the spelling and grammar are correct and ask a friend or family member to proofread it and check for accuracy. Keep it as short as you can â€“ all on one page. It must look clean and professional. 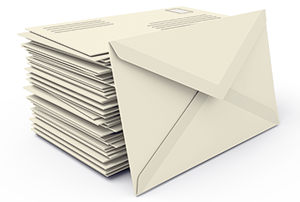 Mail the letter to everyone on the block in a plain white envelope. For your return address, only use your P.O. Box number or street address without your company name. Hand address it in nice handwriting and use a first-class stamp â€“ no metered postage. This method encourages more people to open and read the letter. People rarely receive hand-addressed mail anymore, and the absence of any clues on the envelope will pique their curiosity and encourage them to open it. Wait a few days and begin your follow-up calls. Be patient. It might take three to five different mailings to get a hit. This is an inexpensive way to get business. It might take three or four hours of your time, and about 50 cents per house to mail a first class letter. The point of using this â€œcustom flyerâ€ approach is that it allays customersâ€™ fears that you might be a driveway scam operation. It is far more effective than the, â€œHi. We were working nearby, and we have enough material left over â€¦â€ approach. At the same time, like any advertising effort, there are no guarantees. However, this technique is cost effective â€“ tiny printing costs, especially if you use your own computer and printer. Controlled postage cost. Send as many such letters as you can afford. This is an extremely targeted approach that has very little waste. Itâ€™s cheaper than papering an area with a pre-printed flyer, where you might get one call for every 500 or 1,000 flyers you distribute. In some cases, it might be a good idea to include a paragraph about how long you have been in business, or show a photo of your workplace or other things that will give residents confidence in you â€“ anything that shows that you legitimate and established. Offer an exceptional guarantee on your work. Itâ€™s a great method for contractors who have more time than money, and can help turn that formula around. Most people who have lots of money are very, very busy!